Patients visiting the Trust might think they’re seeing double when they bump into Alexandra Hanson and Sophie Germain – for the twin sisters both work as A&E nurses. Alexandra is based at Sandwell Hospital, whilst Sophie is based at City Hospital. And although the sisters are not identical twins, they are certainly difficult to tell apart – which has left some of their fellow medics and patients confused over the years. 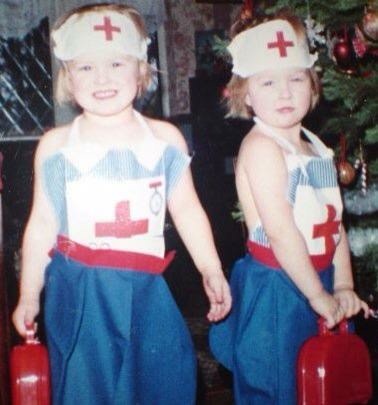 Alexandra laughed: “After we qualified as nurses, we worked in Sandwell Hospital on the same floor. Sophie would work the day shift and then I was on the night shift. Working together as nurses also has its advantages when the sisters are out and about. In 2012, the twins witnessed a road accident involving an eight-year-old girl. Alexandra explained: “The girl had been hit by a van at a bus stop and had been badly injured. She was covered in blood. “We rushed straight to her. Sophie held her, just in case she had a spinal injury and tried to stop the bleeding. I reassured the van driver who looked like he was going to pass out. “Fortunately, the paramedics arrived in time and the girl was taken to hospital, where she was successfully treated. The sisters have always worked together closely, and were first employed at the Trust nine years ago. After starting out as domestic workers, they then went on to university where they studied their nursing degree. Whilst studying, they worked extra hours as healthcare assistants at the Trust. Sophie said of her time at the Trust: “We absolutely love working here. It has been a great experience to work in different roles over many years. Sophie explained that it was her sister who influenced her to join the emergency department. “I came to A&E because Alex told me how great it was and she was absolutely right,” Sophie said. Sophie and Alexandra have recently been promoted to senior nurse level. “The Trust has been very supportive with our development,” Sophie explained. Their ambitions don’t stop there. They plan to undergo more training and the pair are also providing support to students and newly qualified nurses. Click on the clip below to watch the video of Alex and Sophie sharing their story.